What you have are five different lines representing five age groups. You will also see that black and white voters are separated from each other. If any of the age group lines rises above the “0” demarcation, then that means that there was a net positive percentage for black voters in a particular age group for that one Congressional election year. For instance, 1986 showed a net positive for black voters over white voters in the 18-24 age group. The same held true in 2002 and 2010. With some exceptions, all age groups saw a higher net percentage for white voters in most Congressional years. 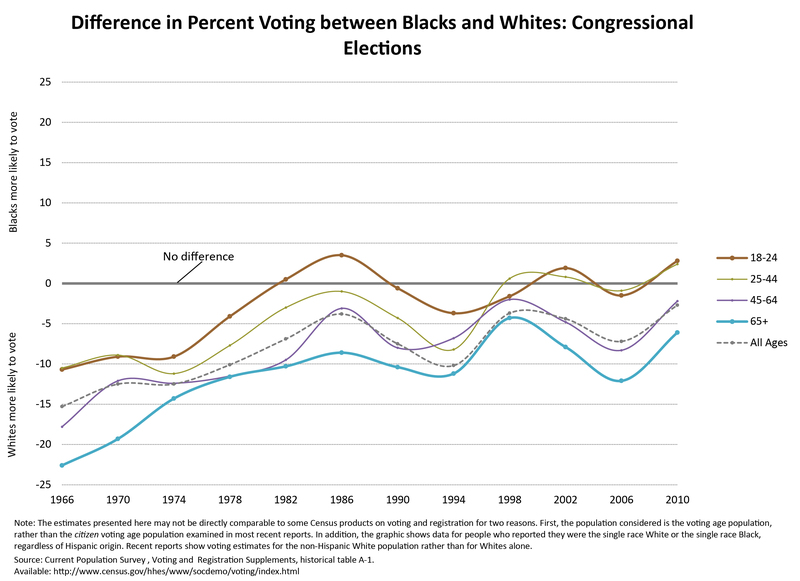 Since this is a midterm election, what do you suspect the trend to be in 2014 in regards to black and white voters? Will the net percentages stay the same or will they be different this time around? Remember, the graph only looks at the years where a Presidential election did not occur. This entry was posted in General Political Science and tagged 2014, Census, Congressional Elections, Elections, Midterm, Race. Bookmark the permalink. I believe that the black vote will increase compared to whites and be greater for most if not all ages. With all the rioting and public media on situations like Ferguson I think it has played a huge opinion on the political point of view of blacks. I think that they will want to be a bigger part of the elections so they can elect public figures that support for movements to stop white on black crime. I believe the white vote will increase more than the black vote because the economy is not yet stable and I believe the only reason the black vote spiked in the last two years is because something that has never happened in history occurred and it was our first black president which was Barack Obama and many people wanted to be a part of it and voted for him. I Still believe blacks still want to have a say because of the things that are happening in Saint Louis and support peace movements on blacks. I believe that the black vote will increase. With all the controversy going on in Saint Louis and after the murder of Trayvon Martin, African American people are relying on a leader that will make the world safer. African American people need a leader that will make their world safer. I believe the white vote will increase because it is only a midterm election and it does not seem like they are as popular as the big elections. With that being said the people will not be as eager to get to the polls because it is not explained to throughly what they will be voting for. It also seemes like only older white people will vote because they seem to be most consistent when it comes to getting to the polls every time. In the 2014 election I believe that there will be an increase in the black vote. There has been a lot of situations going on recently throughout the states such as Ferguson, MO that have outraged blacks and I think they feel its time for a change. These recent events have sparked a lot of peoples emotions and I feel that blacks want change and they want to have someone to be able to advocate for them. I believe that the white vote will increase and the number of black votes will decrease. I believe that people want a change and currently Barrack Obama hasn’t really changed much economically. The economy hasn’t been stable and I believe that there will be a shift towards the number of white votes. I believe that the number of white votes will start to become more consistent when it comes to voting because everyone wants change. I believe that the White vote will increase, but the Black vote will decrease. With the amount of publicity within the last few weeks in Ferguson, a lot of Blacks have been voicing about their lack of faith for any candidate voted into office. Many of these individuals have a “slave mindset” as my father would say; this is the idea that no matter what they do , blacks will never escape their current circumstances. This mindset is exactly why there is no change being made within the black community let alone the government.